Comprehensive Ventilation Cleaning — 100% Satisfaction! At Cleanable Solutions, we recommend routine air duct cleaning every 3-5 years in order to help maintain a healthy and sustainable environment. Most people contacting us are either unfamiliar with the process, or have had a bad experience with other companies. The information below is intended to provide you with a better understanding of how our cleaning process works. Certified technicians will arrive at your home and provide a thorough inspection of your household. Afterwards, the technicians will build a plan most suitable for your particular HVAC system. What makes us a better duct cleaning company than others? 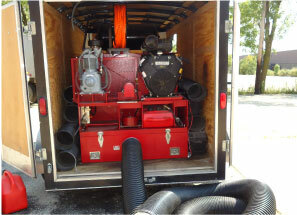 Cleanable Solutions invested in the best duct cleaning truck mount equipment. Our tuck mount isn’t your average carpet cleaning machine, Designed for air duct cleaning only. When it comes to clean air ducts the power is matter our truck mount equipment will generate 15,000 CFM (Cubic Feet per Minute) of air suction, who make us exclusively in the Chicagoland area. What does our cleaning include? Our cleaning method called “Push – Pull” with this method we use 200 pounds (psi) of air pressure to push or pull the dust and debris towards the vacuum hose located near the furnace at the main duct line. 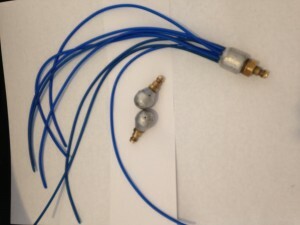 At the end of the air hose there is a ball with 45 degree air blasting holes who will push or pull anything who is in the way. As well we use air whip system to agitate the dust in the duct from the inside. In some cases like fire damage or high build up we use rotary brushes. 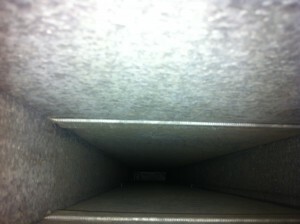 The benefit of using Cleanable Solutions compare to others companies when cleaning duct work. For more information and consolation regarding your heating and cooling air ducts cleaning, don’t hesitate to call us we are here for you. We will be more than happy to help, no obligation required. 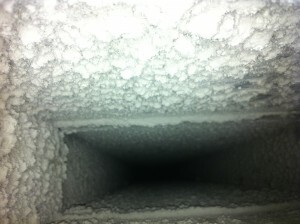 Upon arrival the technician will check to the best possible way to access your air duct system. If the duct work has never been cleaned, an 8” hole will be cut in the main duct line in order to access the supply airside of your system. Next, the hose, connected to the truck, will be fitted into the hole. If the furnace is inside your home, we will first lay down protective tarps. We then start up our truck-mounted vacuum, which creates 15,000 cubic feet per minute (CFM) of vacuum in the duct system. Using 200psi compressed air, we clean out each vent pushing the dirt into the vacuum. Internal duct cleaning devices are used as needed during this process. Once we finish cleaning the air duct system, we clean the main trunk/duct lines (supply and return). Next, we will clean the furnace. This includes the blower motor, heat exchangers, plenum, access doors and air handling unit. Upon completion, all hoses will be removed from the HVAC system. All covers will be placed back onto vents, and furniture will be moved back to its proper place. We then install the 10×10 access plate using metal tape to create an air tight seal, and then four screws to secure it to the duct system.